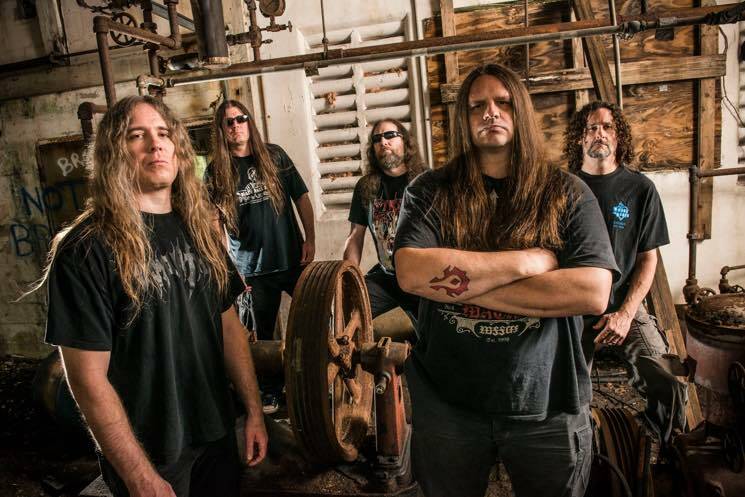 "Pat is currently with family and friends and looks forward to a healthy return at some point"
Following the dramatic arrest of Cannibal Corpse guitarist Pat O'Brien last week, the band have finally broke their silence. Today the group released an official statement regarding the incident. As previously reported, O'Brien is being charged with aggravated assault of a law enforcement officer with a deadly weapon and burglary of an occupied dwelling with assault or battery. The charges stem from a terrifying incident on December 10 when the guitarist allegedly broke into a neighbour's home in Northdale, FL, and shoved her to the floor, warning of the rapture. All the while, his house was being engulfed in flames as ammunition was causing explosions inside the home, which reportedly contained more than one flametower, as well as roughly 50 shotguns, 10 semiautomatic rifles, two Uzi-style rifles and 20 handguns. During his court appearance, O'Brien wore an anti-suicide vest and was shackled to deputies. The guitarist could face up to 30 years in prison or a potential lifetime sentence for the felony charges. The arrest came just as Cannibal Corpse were announced as openers for the next leg of Slayer's farewell tour.